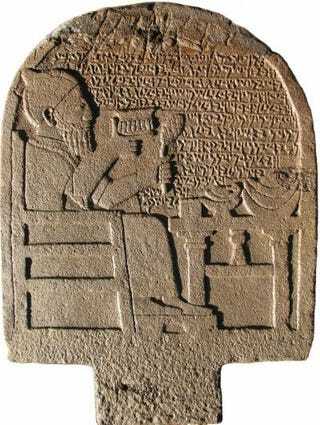 I, Kuttamuwa, servant of Panamuwa, am the one who oversaw the production of this stele for myself while still living. I placed it in an eternal chamber(?) and established a feast at this chamber(? ): a bull for [the storm-god] Hadad, ... a ram for [the sun-god] Shamash, ... and a ram for my soul that is in this stele. Kuttumuwa's inscription shows a fascinating mixture of non-Semitic and Semitic cultural elements, including a belief in the enduring human soul-which did not inhabit the bones of the deceased, as in traditional Semitic thought, but inhabited his stone monument, possibly because the remains of the deceased were cremated. Cremation was considered to be abhorrent in the Old Testament and in traditional West Semitic culture, but there is archaeological evidence for Indo-European-style cremation in neighboring Iron Age sites.